In 1969, Jack Kirby contributed costume designs to the University Theater Company at the University of California, Santa Cruz for a production of "Julius Caesar." The designs were typical Kirby, with artistic flair that you just don't get anywhere else. More interestingly, the designs were indeed used and there are a handful of photos from the show (though I can't find any good reproductions of them online). It's a really minor part of Jack's overall career, and it frequently gets overlooked, so I thought I'd run the text from an article from the May 3, 1969 issue of Peninsula Living which talks about the production and how Kirby got involved. Scans of the article and several of Jack's designs can be seen over at the Kirby Museum site. Almost ironically, the last sentence of the piece is about Stan Lee, who did nothing more than relay director Sheldon Feldner's letter to Jack. GET A GOOD GRASP on your sense of reality, friends!!! Honest!!! It's true!! Brutus and Dr. Doom have nothing in common!! SSKATATCH??!!! Julius Caesar and The Mighty Thor are not look-alikes!!!??? The Fantastic Four never visited Shakespeare -- via Time Funnel -- on his set at the Globe!!! No. NO!! Back to REALITY!! Sheldon Feldner offers a pleasant, smiling kind of reality, until he starts to explain things about comic books, especially MARVEL-type comic books, and Caesar, and assorted other exotica, the nature of which will presently be manifest. And then it becomes a kind of 4-D super-R-E-A-L-I-T-Y (! ! !) that brings us back to the point of beginning. Hold on. This is about Sheldon, and Caesar, and Marvel, and Shakespeare. Sheldon is director. The "Caesar" he's putting together is far from the traditional. The idea is to emphasize the concept of the play, its essential reality, by translating it into technical terms. A fundamental idea in Shakespeare was that when the world of man was about to undergo chaos, the heavens signaled it -- for example, the storm in "Caesar," before the assassination. So an appropriately wired dome will hang over the stage to flash lightning in storm, or change color to bode a universe of blood. It is important, Sheldon feels, to show the division between the public and private lives of man, the political and the personal. And so, closed-circuit television will be used, with monitors in the audience. Viewers will see scenes as "political" events on television -- the riots in the streets of Rome, for example -- as well as on stage. A laser-like device will create Caesar's ghost and when it speaks, the voice will be broken down into an oscilloscopic image and projected on a huge screen. Talented students produced a tape combining electronic music and sounds of the riots at the Democratic convention to run with the civil war and riot scenes. And then, having conjured up all these electronic marvels, Sheldon faced a terrible problem: the costumes. Sandals and togas certainly wouldn't be suitable. Modern dress wouldn't be, either. Besides, it's been done. "So I was taking a walk one night," says Sheldon, who joined the University staff last fall as a fellow in Merrill College, "and I thought of Marvel Comics." Sheldon has had previous experience with Actors' Workshop and Stanford Repertory Theater. "Last year I worked in summer stocK with a guy who was a big Marvel Comics buff. It's a cult. He turned me onto it, and I was hooked." So the next thing he knew, Sheldon was writing this letter to the president of Marvel: "Dear Sir: I think I'm crazy, but..."
"Marvel Comics ARE different," Sheldon says. "They're not the Superman or Batman type. They're not the Bugs Bunny type. "No, all the characters in Marvel Comics have some sort of identity crisis. "Like. Captain America, for example. He was a World War II hero. After the war, his sidekick was killed by Red Skull. And he always blamed himself, because he didn't tell his sidekick to jump off the rocket in time. "Then he was frozen alive in a glacier. But years later, he was brought back. Here he is, a 50-year-old super-hero, and he can't relate to the new generation of young super-heroes. "All the 'Marvel Comics heroes have something like that wrong with them. "They're anti-war super-heroes. In one of last month's issues, a whole army marched by wearing peace symbol arm patches. "Marvel characters use Robert Frost poetry sometimes, and one magazine recently ended an episode with a poem by Keats. "Anyway, my letter. It turned out that Stan (The Man) Lee, president of Marvel, is a Shakespeare buff. 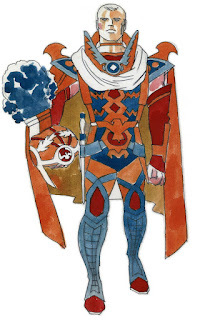 And so is Jack (King) Kirby, who finally designed our costumes. "Marvel has about a dozen magazines, and authors. Stan Lee wrote back, said he'd ask his artists and see if anyone was interested. And Kirby, who recently moved West to live in Irvine, was. "An assistant and I drove down, and stayed at Jack's overnight. We watched 'Spartacus' on TV and talked about Roman armor. But mostly, we listened to Jack talk about "Julius Caesar.'" Kirby was the creator of Captain America and the Silver Surfer, but no longer draws them, Sheldon said. Currently, he is doing The Fantastic Four and Mighty Thor magazines. Again, he created the characters. "Talking about Thor, Jack said he doesn't draw authentic Norse armor, but tries to get the essence of it. I said that was what we wanted to get at, too -- something that could be both ancient and modern." Kirby talked a great deal about color and its use, Sheldon recalls, as well as the use of expectation -- in the sense that the title page of a comic book starts off with the climax that it will build up to out in back. Kirby very definitely had some of his own ideas about staging "Julius Caesar," and many of them will be reflected in the production. The conspirators all throw open their robes after the assassination, wearing them over the shoulder. Inside, the robes are all blood red. The very cut of the robes is modeled after the silhouette of the vulture. Another of Kirby's ideas is the costume Caesar wears when he first comes on. It is traditional for him to wear civilian clothes. But Kirby has him come on in military attire like some sort of fantastic creature. "But, why not?" Sheldon asks. "This way, the people have every reason to believe he may install himself as a dictator." The costumes for the cast of 50 are being made primarily from military surplus materials. The cloaks are old army blankets which had been consigned to the rag bin. Old GI longjohns were converted into tights for the plebians. Headgear is made from old helmet liners. "We're using a lot of vinyl and plastic," Sheldon says, "with no attempt to disguise the materials." Overseeing production of the costumes is one of Deena Ferrigno's chores as technical director, and it's no small chore. A full-time University employe [sic], she shares responsibility for the production with Sheldon. "This is the first time I've had to do a show that somebody else designed," she said. "The first time I saw them, I wondered, "What are they supposed to look like from the back and from the side?" And then I thought, 'Our students aren't built like that.'" But somehow or other, the costumes are being made -- complete in back and front, though of materials of sometimes dubious origin. "Like those soldier costumes," Deena said. "They're decorated with some kind of sliced sponge. We got it in this old warehouse. I don't even know what it's for..."
How well is she doing? They look good, but perhaps the final verdict should be reserved until opening night. Kirby, who has visited the campus once already, is coming back for the opening. Seeing the production is going to be his principal reward for the costume designs. "I asked about paying him," Sheldon says, "but he said not to worry about it -- we couldn't afford him. He felt that because it was for college students, that it was a contribution he wanted to make. "Stan Lee is the same way -- loose, friendly, inertested [sic] in other people."